Germany's 'In The Fade' Flips The Script On The Terrorism Film Filmmaker Fatih Akin says he made In the Fade to spotlight something terrorism stories often overlook: the victims. It follows a woman whose husband and 6-year old son have been murdered by neo-Nazis. Diane Kruger won the top acting prize at the Cannes Film Festival for her performance in In the Fade. She dedicated her award to survivors of terrorism. In recent years, films about terrorism have become their own kind of genre. They're often geopolitical thrillers or espionage dramas, but a new film from Germany takes a different — and more intimate — approach. In the Fade, Germany's entry to the Oscars, tells the story of a survivor picking up the pieces of her broken life. German filmmaker Fatih Akin says he made the film to spotlight something terrorism stories often overlook. "You don't know [anything] about those people who died. It's just numbers — 30 people died, 135 people died — and you don't know [anything] about the left ones — the mothers, the parents, the children. But what you do get to know immediately is the murderer was Abu Jihad I-Don't-Know-What. ... Everything about the murderers. I was more interested about the victims." So In the Fade focuses on a victim who was left behind. It's the story of a wife and mother named Katja. She's driving to a Turkish neighborhood in Hamburg to pick him up her husband and 6-year old son when she sees flashing lights. The street is cordoned off and it's obvious something is very wrong. Then the camera reveals the bombed-out remains of her husband's office. Katja is played by Diane Kruger, who won the top acting prize at the Cannes Film Festival for her performance. Before filming, the actress spent months with families who have experienced that kind of loss. "Families that couldn't say goodbye to their loved ones because there's no body left, or how mothers deal with the death of their children," she says. "So just listening to that is something that I'll never forget." The police in the film are less empathetic. Katja's husband is a German of Kurdish background, and the interrogating officer immediately assumes he was involved with Islamists. He asks, "Was he religious? Was he involved with the mafia?" In the Fade flips the script on the terrorism film: It turns out Katja's husband was murdered by neo-Nazis. The movie is based on the true story of killings that were allegedly carried out by the National Socialist Underground between 2001 and 2009. German Public Radio film critic Patrick Wellinski remembers those years. "The police [were] investigating murders that occurred all over Germany," he says. "Migrants were killed, nine: one Greek and eight Turkish men were killed. And they didn't even have the idea that all the murders were connected, that the all murders were perpetrated by terrorists, by right-wing terrorists. And after this was uncovered, the whole society was like in shock: politicians, you know, citizens, the media. The media had a very crucial role ... and I think this is a shock which still lingers on." For filmmaker Fatih Akin, who was born in Hamburg to a family of Turkish immigrants, those murders felt personal. He says, "I was very angry when all the truth came out, when we knew that the police [were] wrong and the media was wrong and the public was wrong by blaming the victims to be involved in some criminal activities just because they have backgrounds, you know. That [is] the fact which bothers me more than the essential killings." What bothers Diane Kruger, the film's star, is the way neo-Nazis have resurfaced in Germany since she left for Hollywood more than two decades ago. "I remember in the '90s, you know, they were skinheads, or ... visually, they were different," she says. "They took pride in cutting their hair a certain way and dress[ing] a certain way. And now they look like, you know, you and me. You don't recognize them, which makes them more dangerous. And I'm, as a German, I'm ashamed of it, that that still exists, especially in our country." When Kruger's character goes on a vengeful quest to find out who murdered her family, she uncovers a network of right-wing racists stretching from Germany to Greece. Fatih Akin says it was important for him to cast a blond, blue-eyed German actress as the face of righteous rage against neo-Nazis. "I know a lot of Germans, friends of mine — white people who really have a problem with the Nazis we have there, you know — saying things like, 'Somebody should take a machine gun and blow them all away.' I hear this from German people. So you have this radicality by white folks, you know, and I want to use that, I want to use that element. I thought it would be more complex and less cliché." 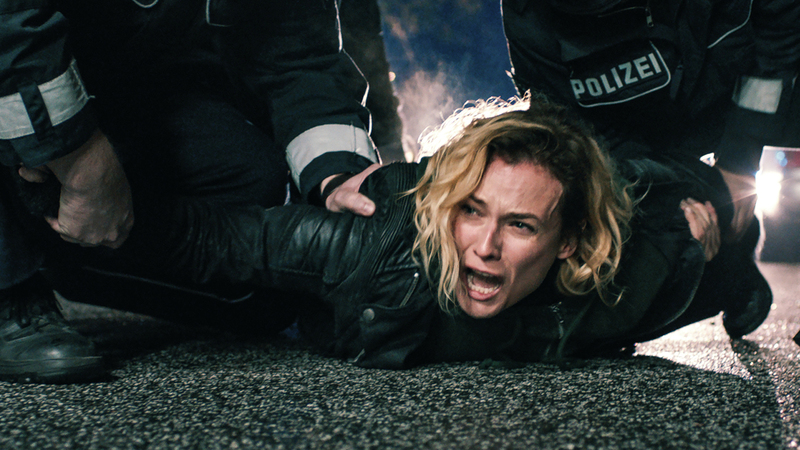 In the Fade arrives at a time when anti-immigrant movements are flourishing around the world. But Akin's anger over what's going on in Germany doesn't mean he's lost hope. "I am optimistic that things will turn better — you know, truly optimistic," he says. "But I don't know when." Where there's darkness, there's also light, Akin says. And this film is his contribution — a personal story about finding a way out of the darkness. Tom Cole and Smokey Baer edited and produced this story for broadcast. Nicole Cohen adapted it for the Web.